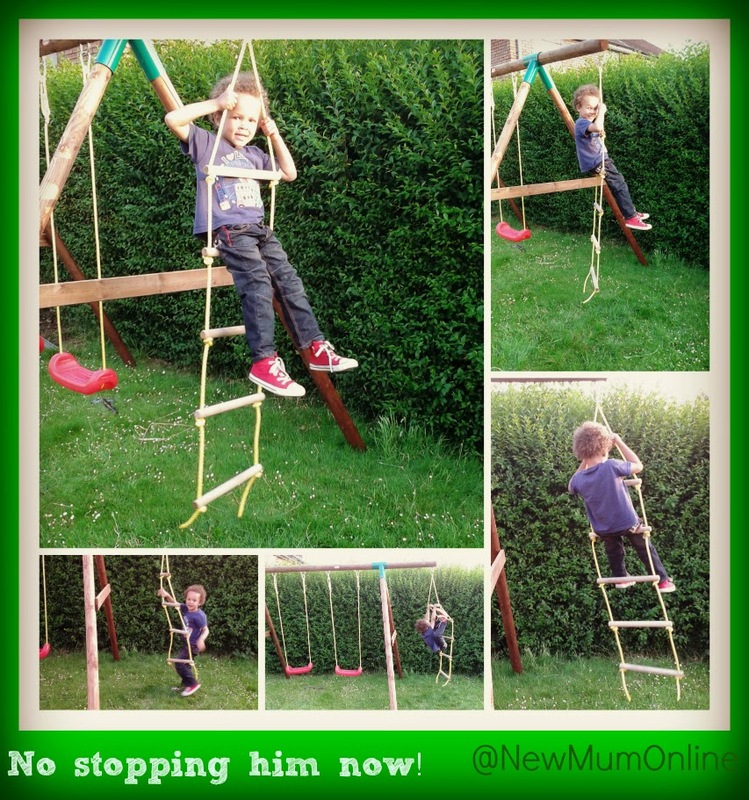 Aaron's favourite part of the garden has to be his swing. Being that he is an only child, he finds very inventive things to do with it, often making me laugh with him imagination. We got it back on Saturday 10th May so have had plenty of time to review it. One wet (as you can see by the jacket below) day, he decided that the swings were curtains, and had great fun running through them. It did amuse me... lots! Then he discovered the ladder and there was no looking back. At first it was a big effort to clamber onto the bottom rung, make it swing AND hang on. It's funny to watch this back, when I now know he can scamper to the top rung, and swing and sit there effortlessly like he's had it for years. Children progress SO fast don't they? Sometimes it's just fun to "wind it up" - the possibilities with the imagination of a young mind are endless! Literally! I love how he uses the swing's ladder to get a better view. I know a piece of furniture can't be a "friend" but Aaron's certainly made one out of his swing! 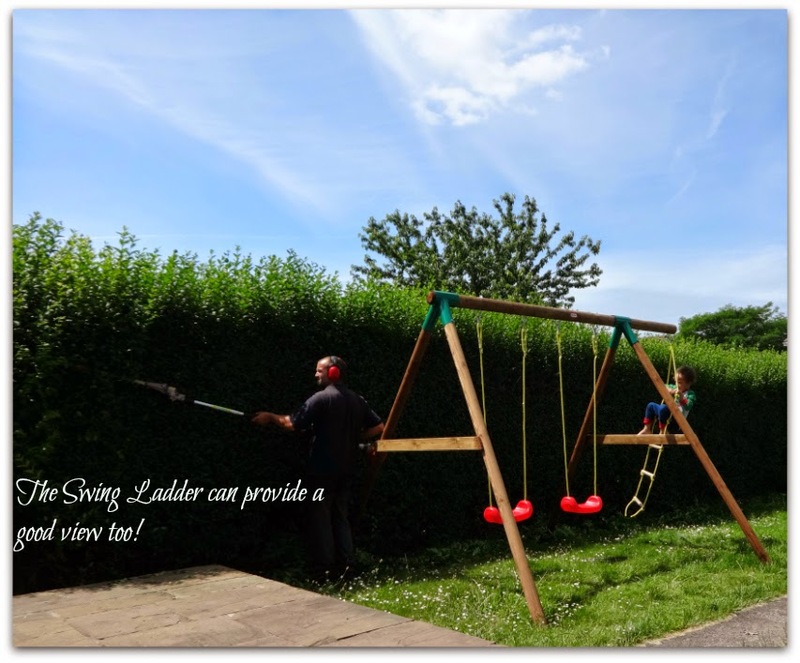 If you are considering getting a swing for your garden you won't regret it. It doesn't take overly long to assemble but with some of the pieces there is not a hole. If you hammer to create one, do so very gentle, as you can cause the wood to crack. A wooden swing is SO much nicer than a metal framed one. We've had lots of compliments on it. It looks at home in the garden. The instructions do say to set the feet in concrete - we are yet to do this so it does squeak and rock a tad when we're on it. I love the metal harnesses that attach the swing rope to the frame. They feel very secure. 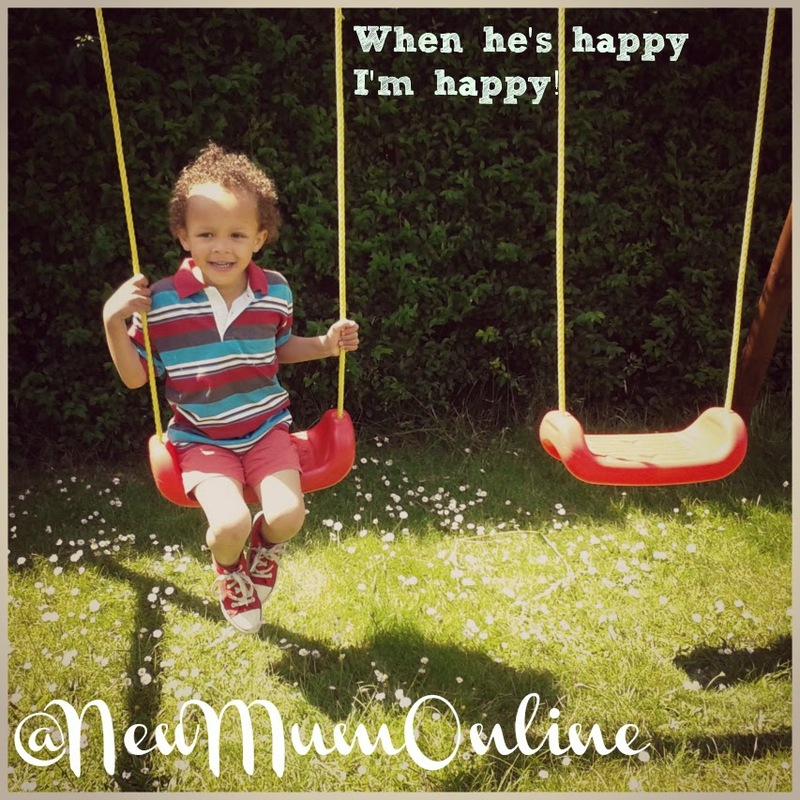 Having a swing in the garden IS great as it means you can do other things, BUT he often wants me to "push him on the swing"... so it hasn't freed me up completely, but when he knows I am really busy, he finds other imaginative ways of playing with it. Daddy is actually a lot more patient at pushing Aaron on the swing. Means I can cook dinner when they're both out there. Great addition to the garden! Don't take my word for it: read these reviews! I will make a you tube video of all of my clips when I get a spare moment. Do you have garden furniture? We are yet to join the trampoline craze that has spread the country but we long ago joined the scooter craze! I know we will probably end up with a trampoline one day but for now, I enjoy being able to see as much of the grass as possible, and the swing doesn't interfere with that - it's a very welcome addition to the family. 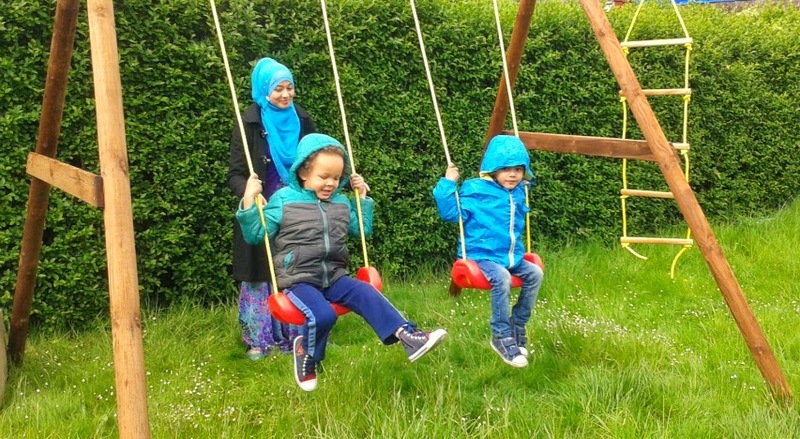 Disclosure: we were sent this swing in exchange for an honest review and are very happy with it too (apart from the rocking and squeaking, which one day we'll address by setting the feet in concrete). Everyone in our house has been busy! Lots of days out lately, along with BritMums Live, and Aaron's birthday meant we got the hedge cut by a gardener - Aaron was fascinated watching him. It was powered by petrol, so it's great not to have a cable trailing all over the place! Nice review. My sister and I used to lov eour swing too. We had a wooden swing that fit in nicely with the garden. my girls love their swing set and the climbing frame! Garden swings are great. We used to have one with a slide and a platform at one end and it provided hours of entertainment. Looks fab. I am so desperate to move somewhere with a garden, but 4 months into our search we are no closer! A swing is top of my wish list once we find the right house though! My only worry is, will it occupy a lot of space? 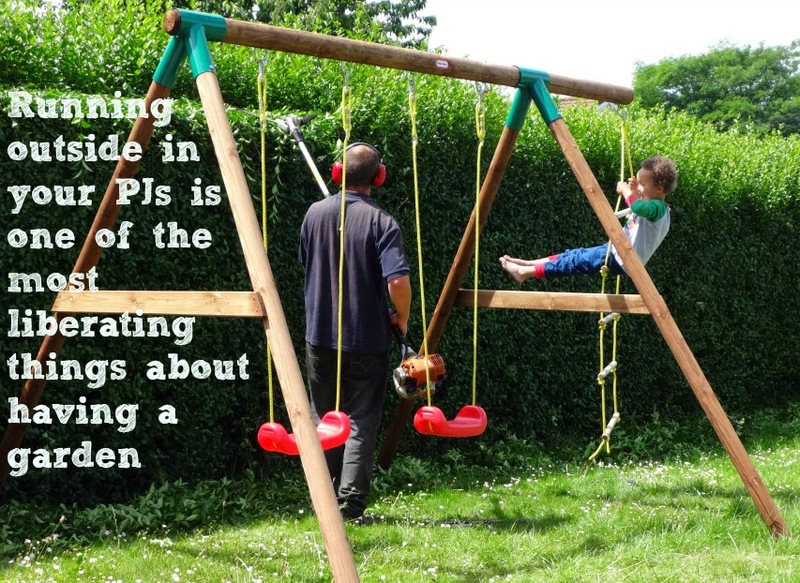 I would love to have a swing and a trampoline in my garden if it would all fit in! That looks really lovely and is cheaper than I thought it was going to be. We had to chop our old one down when we moved earlier this year because Ant set it in so much concrete we couldn't move it! Wish we had the space! Our garden is on the small side. :( I have tried looking for a single swing with a slide but haven't found a suitable one. YOU HAVE A GARDENER??? haha nice. What a brilliant swing set! We have a playhouse but would love to get a swing and climbing frame for the garden. I would love to have a swing like this in the garden.